I say "a little different" because it's an alcoholic beverage, but it's a lot different than beer. I rarely veer off the beer rails around here, but a PR firm that sends good beer stuff my way — Punch Media — sent some cans of Quaker City Shrubs. This news might look a bit dated by the press release date and the official event date. That's how long it took for me to get around to sampling the product. (Remember, I don't post just any press release; I need to have some type of personal experience that I can relate and vouch for.) Plus, with this delay, I can now report that the area Wegmans, and I'm presuming other advertised retail outlets, are carrying 6-packs ($9.99) of all three varieties in cans. Personal favorite? Probably the blackberry, followed by apple, followed by grapefruit. What you'll find in each is a remarkably clean, refreshing, and flavorful beverage perfect for summertime and as a break between long beer drinking sessions. And look at those 90 calories! The dose of apple cider vinegar (which, imo, could be dosed up just a tad more but is noticeable nevertheless) adds great flavor plus a well-documented health benefit. Something that I haven't been able to find in hard seltzers (haven't found one worth my dollars yet) and hard cider (feel like I need to apologize, don't know why, but sorry I've found many to be too sweet, too insipid, or otherwise unmemorable to become a regular go-to beverage). Plus, while I'm no expert mixologist, I think the suggestion is spot-on and could see these serving as perfect mixers. Enough from me, here's the press release. 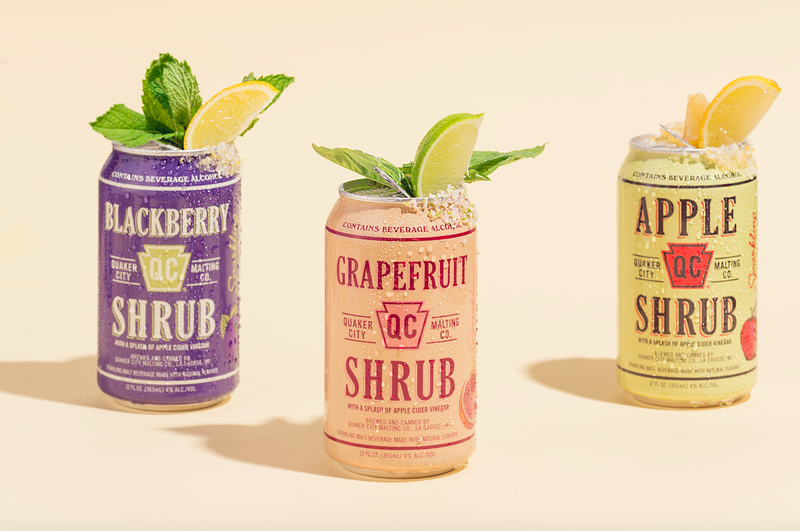 PHILADELPHIA, PA — June 20, 2018 – Spirits industry pioneer Steven Grasse, in partnership with Diageo, is pleased to announce the release of Quaker City Shrubs - a brand new line of sparkling, tart, and tangy canned alcoholic beverages made with apple cider vinegar. 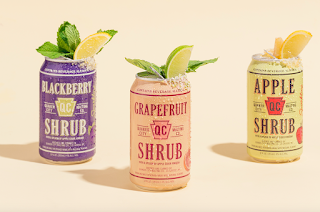 Hitting shelves June 25, just in time for the start of summer, Quaker City Shrubs present at 4% ABV with just 3g of sugar and are only 90 calories. Consumers can choose from natural fruit flavors including Grapefruit, Blackberry, and Apple. These low-calorie, low-sugar and low-ABV beverages are delicious straight from the can, poured over ice, or used as mixers in simple cocktails. They offer imbibers the perfect all-natural alternative to beer and cider compared to other ready-to-drink cocktails which are commonly packed with sugar or cold-fermented dextrose (found in most hard seltzers). Apple cider vinegar enhances natural fruit flavors while adding tart, tangy notes and a dry finish. The inspiration for Quaker City Shrubs came to Grasse when he discovered this classic historical shrub recipe while doing research for his book, Colonial Spirits. Traditionally, a shrub was used as a way to preserve fruit by combining it with sugar and vinegar. This concentrated liquid could then be watered down with still or sparkling water (or spiked with rum or brandy) for a refreshing, fruity treat in any season. Quaker City Shrubs launch this summer at Whole Foods, Wegmans, and Total Wine stores across the Philadelphia, Delaware, and southern New Jersey regions, as well as at boutique bottle shops, beer distributors, and your favorite neighborhood bars and beer gardens. Quaker City Shrubs are made with all natural ingredients and boast only 3g of sugar and 90 calories. At 4.0% ABV the liquid is specially crafted to remove gluten. Quaker City Mercantile is celebrating the official launch of #SummerofShrubs on July 17 (6-9pm) with a Bokyard BBQ, QC Shrub tastings and specials (with RSVP), Shrub Floats courtesy of Capogiro Gelato Artisans, bites from South Philly Smokhaus BBQ and Simply Good Jars, a garnish station from Greensgrow Farms and fruit kebabs thanks to Riverwards Produce. Noted WXPN DJ, Robert Drake will be providing the beats and guests will enjoy the QC Shrubs Smilebooth all while taking in the gorgeous Philly views from Bok Bar’s scenic rooftop bar. The event is free but guests must RSVP through Eventbrite. Quaker City Mercantile will be donating $1 for each guest towards Southwark School. For more information and recipe inspiration visit Quaker City Shrubs on Facebook, Twitter, and Instagram, and follow along with #SummerofShrubs. Quaker City Shrubs is a product of Quaker City Mercantile and Diageo, the world’s largest producer of spirits. Drawing inspiration from a classic historical recipe, Steven Grasse created Quaker City Shrubs as an alternative to beer and cider with an unlikely ingredient: apple cider vinegar. Presenting at 4% ABV with just 3g of sugar and only 90 calories, the sparkling, tart, and tangy alcoholic beverages come in an array of natural fruit flavors, including Grapefruit, Blackberry and Apple. For more information please visit instagram.com/quakercityshrubs/.